Hello friends :) Another week gone by and another fabulous Friends With Flair Friday! I love Fridays!!! A bunch of my online friends are getting together for the weekend in Baltimore. I was supposed to drive up early tomorrow morning (5:00am) so I would be there by 10:00am and have the entire day, buuuut....of all times to get a stomach bug...YUCK! So, I am going to snuggle up with a movie and cross my fingers that this is just a minimal day thing. I think the worst is behind me though :) Enough yucky talk..on with the flair!!! Hope you feel better and enjoy your movie...even if you can't be with your pals! AND lovin' the color transitions in your card! So cool! Love the ombre effect! So cute! I love the graduated colors for the chevron stamp! Hi Pryn! What a Gorgeous card!! Love the chevrons (in my fave colour) and that cute sentiment. Have a lovely weekend!! Super cute card! B-more will have good weather tomorrow. (that's where i'm from!) Hope you feel better! Simple & perfect! Hope you're well enough for your trip. Pryn, I absolutely LOVE this! How did you get your chevron pattern so perfectly even? Beautiful card. And I hope you are feeling better. Great card, I really love the colors in the chevron stripe! Hope you are feeling much better now and have a great rest of your weekend! This is really pretty! Very striking design. Hope you feel better soon! 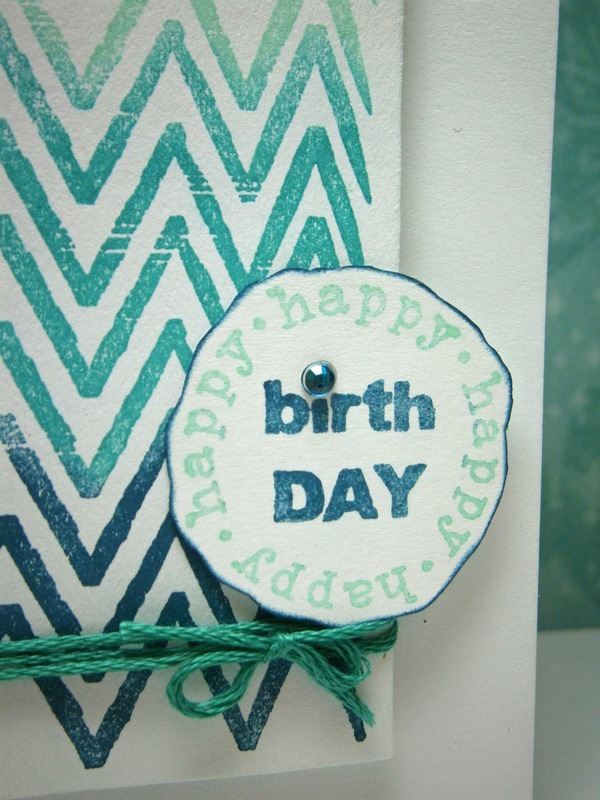 The card is really great, love that chevron background and the color you used is perfect. Great use of color! Cool card, hope you are feeling better quickly. Very nice card using the backgrounder. NIce card. And who's that sweet dog in your blog? Awww.. Wonderful use of that chevron stamp and loving the colors! Hope you feel better soon! I love the gradient and especially in that palette because it seems to be my favorite color these days. I hope you feel better soon! I love my Versamagic inks. They worked beautifully on this chevron pattern! i love the colors!! sorry you had to miss your get together. Aw Pryn, I'm sorry you are missing the Baltimore weekend! What a bummer. Feel better! 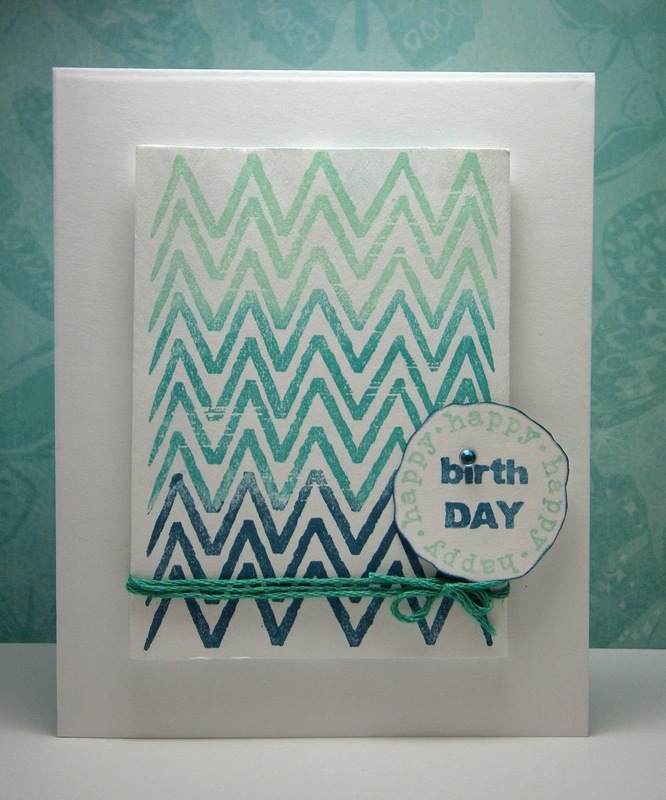 Love your card, the colors and chevron are striking! So sorry that we missed out on your being there! :( We all had so much fun, but it would have been even Better had you been able to join us! !